The U.S. Air Force's first Lockheed Martin built-GPS III satellite was launched on Dec. 18. DENVER --- At approximately 12,550 miles (20,200 km) up... turn left. You have arrived at a new era for the Global Positioning System (GPS). A major milestone in the U.S. Air Force's plan to bring new technology and capabilities to the GPS constellation, the first Lockheed Martin-built GPS III satellite began "talking" with engineers and operators from ground control, as planned, following its successful launch this morning. GPS III Space Vehicle 01 (GPS III SV01) is now receiving and responding to commands from Lockheed Martin's Launch and Checkout Center at the company's Denver facility. Air Force and company engineers declared satellite control signal acquisition and rocket booster separation about 119 minutes after GPS III SV01's launch. The satellite lifted off from Cape Canaveral Air Force Station, Florida aboard a SpaceX Falcon 9 rocket at 8:51 a.m. EST. GPS III SV01 is the first of an entirely new, next generation GPS satellite designed to modernize the GPS constellation. GPS III has three times better accuracy and up to eight times improved anti-jamming capabilities. Spacecraft life will extend to 15 years, 25 percent longer than any of the GPS satellites on-orbit today. GPS III's new L1C civil signal will also make it the first GPS satellite broadcasting a compatible signal with other international global navigation satellite systems, like Europe's Galileo, improving connectivity for civilian users. 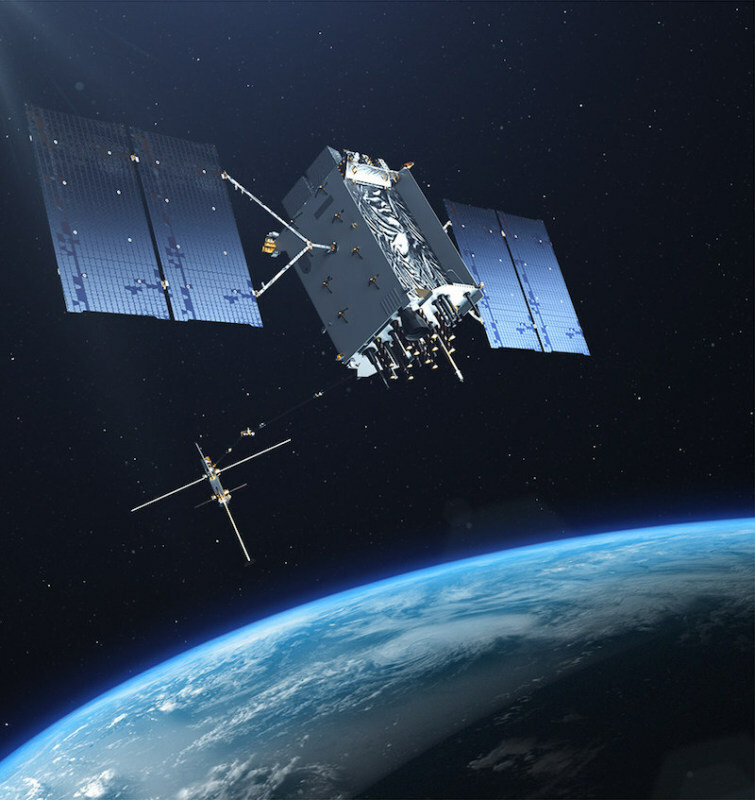 Once declared operational, GPS III SV01 is expected to take its place in today's 31 satellite strong GPS constellation, which provides positioning, navigation and timing services to more than four billion civil, commercial and military users. The Air Force nicknamed the satellite "Vespucci" after Italian explorer Amerigo Vespucci. "In the coming days, GPS III SV01 will use its liquid apogee engines to climb into its operational orbit about 12,550 miles above the earth. We will then send it commands to deploy its solar arrays and antennas, and begin on-orbit checkout and tests, including extensive signals testing with our advanced navigation payload provided by Harris Corporation," said Johnathon Caldwell, Lockheed Martin's Vice President for Navigation Systems. Air Force and Lockheed Martin engineers are controlling GPS III SV01's launch and checkout test using elements of the GPS Next Generation Operational Control System (OCX) Block 0. Satellite control and operations are expected to shift to the Air Force's current Operational Control Segment when GPS III Contingency Operations upgrades are fully implemented later this year. "This is the Air Force's first GPS III, so we are excited to begin on-orbit test and demonstrate its capabilities," Caldwell said. "By this time next year, we expect to also have a second GPS III on orbit and users should be receiving signals from this first satellite." Lockheed Martin developed GPS III and manufactured GPS III SV01 at its advanced $128-million GPS III Processing Facility near Denver. In September 2017, the Air Force declared the satellite "Available for Launch" (AFL) and had the company place it into storage. Last summer the Air Force "called up" the satellite for launch and Lockheed Martin delivered it to Florida on Aug. 20. On Dec. 8, GPS III SV01 completed pre-launch processing, fueling and encapsulation at Astrotech Space Operations, in Titusville, Florida. GPS III SV01 is the first of 10 GPS III satellites originally ordered by the Air Force. GPS III SV03-08 are now in various stages of assembly and test. In August, the Air Force declared the second GPS III "AFL" and, in November, called GPS III SV02 up for a 2019 launch. In September, the Air Force selected Lockheed Martin for the GPS III Follow On (GPS IIIF) program, an estimated $7.2 billion opportunity to build up to 22 additional GPS IIIF satellites with additional capabilities. GPS IIIF builds off Lockheed Martin's existing modular GPS III, which was designed to evolve with new technology and changing mission needs. On Sept. 26, the Air Force awarded Lockheed Martin a $1.4 billion contract for support to start up the program and to contract the 11th and 12th GPS III satellite. Lockheed Martin is proud to be a part of the Air Force's GPS III team. The GPS III team is led by the Global Positioning Systems Directorate at the U.S. Air Force Space and Missile Systems Center. Air Force Space Command's 2nd Space Operations Squadron (2SOPS), based at Schriever Air Force Base, Colorado, manages and operates the GPS constellation for both civil and military users.